Mark your calendars! Come to see Archangel Alliance again this year at the BOO BASH! Friday night, October 26th at Joint Force Headquarters in Raleigh, NC from 6 PM to 9 PM! 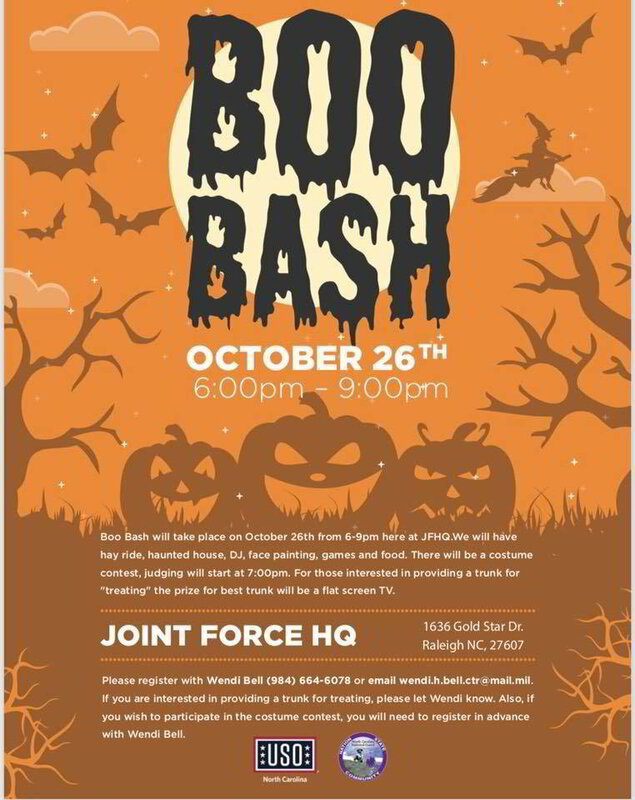 The Boo Bash at Joint Force HQ will have a hayride, haunted house, DJ, face painting, games, and food. There will be a costume contest and judging will start at 7 PM. For those interested in providing a truck for "treating" you will have a chance to win a prize for having the best trunk. The prize will be a flat screen tv. If interested, please register with Wendi Bell at (984) 664-6078 or email her at wendi.h.bell.ctr@mail.mil. If you are interested in providing a trunk for treating, please let Wendi know. Also, if you wish to participate in the costume contest, you will need to register in advance with Wendi Bell. Joint Force HQ is located at 1636 Gold Star Dr. Raleigh, NC 27607.